Increasingly used as the emblem of China, the cuddly and lovable giant panda lives nowhere else in the world outside captivity. The giant panda is on the WWF logo and is known as a &apos;national treasure&apos; in China. Giant pandas look like bears but they have a distinctive black cand white appearance. Their four legs are covered in black fur and they have a black band around their shoulders as well as their eyes and ears. Here&apos;s one fact that you may not have noticed before. Guess what color their tail is? It’s white! A wild giant panda typically stands at 75 centimeters (2½ feet) tall and 1.5 meters (5 feet) long. Read more about Giant Pandas&apos; Characteristics and Appearance. According to the census of 2014, there are only 1,864 giant pandas alive in the wild. It is one of the rarest and most endangered species in the world, thus the giant panda was selected and used as the symbol of the WWF since its formation in 1961. Now the only remaining suitable habitat for giant pandas is on remote mountainsides about 1,200 to 3,100 meters (4,000 to 10,000 feet) above sea level. These are in the Tibetan foothills of Sichuan, Gansu, and Shaanxi provinces. They can only live in large bamboo forests because bamboo is their main food. 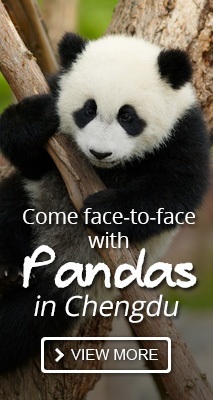 Chengdu (Sichuan Province) has many large panda bases and nature reserves that protect wild and captive pandas. 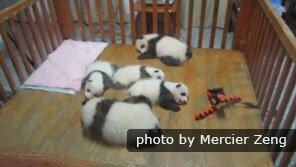 If you want to see baby pandas, get close to pandas, and track wild pandas, go to Chengdu. 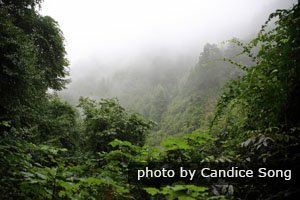 Read more about Giant Pandas&apos; Habitat — Bamboo Forest in Western China. 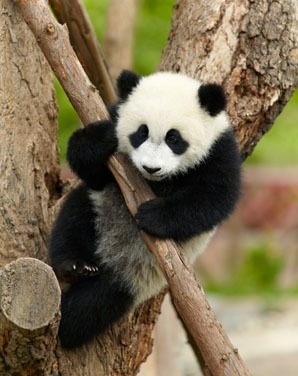 Giant pandas love climbing trees, particularly the playful cubs. Giant pandas spend as long as 14 hours eating per day as the bamboo provides a low amount of calories so they get hungry very quickly. When they are full, they will sleep for 2 to 4 hours. When they wake up again, they will look for more food. Besides eating and sleeping, they also climb trees. Yes, a giant panda can climb trees! They climb trees to get away from danger, propose to partners, and evade stronger competitors. Read more about Giant Pandas&apos; Behavior — What Do They Do All Day. Giant pandas eat bamboo roots, bamboo shoots, and bamboo leaves. Bamboo forms 99% of their daily diet. Other than bamboo, they also eat some types of fruit. Captive giant pandas also eat “panda cake” that has been made from rice flour, soybean powder, corn flour, and egg. Wild pandas will also eat grasses, insects, mice, and even lambs found in surrounding villages. 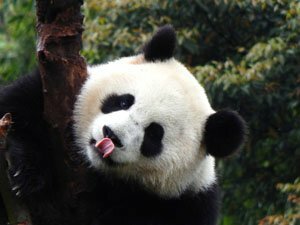 Read more about What Giant Pandas Eat — Bamboo, Fruits, and Panda Cakes. Giant pandas&apos; habitats were reduced because of people’s logging and farming activities. Giant pandas were also being poached and hunted. They were once endangered due to their disappearing habitats. On September 5th, 2016, the giant panda was removed from the endangered list and is now on the "vulnerable" list. China protects giant pandas&apos; habitats by returning farmland back to forested areas. Giant pandas have been saved from earthquakes, bred in captivity, and then introduced to the wild. Read more about Why Giant Pandas Are Endangered and How China Protects Giant Pandas. A giant panda is eating bamboo. Reproduction: one cub per 2 years; mating occurs in spring and a cub is born in late summer. Also see 13 Interesting Facts on Giant Pandas. Many travelers make their trips to China for the giant pandas. 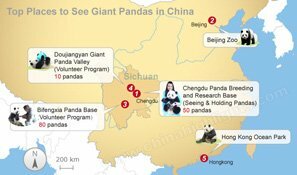 There are many places in China where you can see giant pandas but the best places are around Chengdu in Sichuan Province, "the giant pandas&apos; home town". 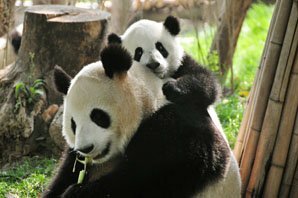 If you want to have more close contact with a giant panda, such as joining in a giant panda volunteer program to take care of them, you need to travel to Chengdu. We have specially-designed panda tour packages, offering you a chance to get close to giant pandas. These can be tailored to include Mount Qingcheng and other Kung Fu Panda sites. 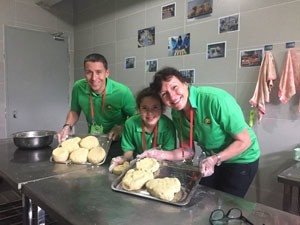 Our travel advisors can also help you tailor-make a tour according to your requirements. 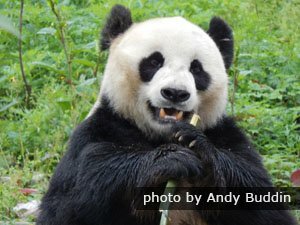 4-day Wolong in-depth Panda Tour — Explore panda&apos;s nightlife.